ISTAT members across the globe celebrated the holiday season and capped off an eventful year at the ISTAT Holiday Receptions. 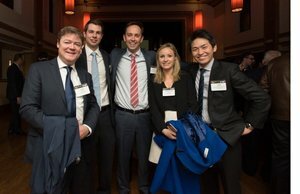 The events were held 7 December in six locations: Dublin, Hong Kong, London, Greater Miami, New York and Tokyo. Hundreds of members attended each reception and networked with longstanding peers and industry newcomers. View photos from all six Holiday Receptions. Registration for ISTAT Americas – 5-7 March 2017 at the Hilton San Diego Bayfront in San Diego, CA, USA – is now open! ISTAT Americas will feature felicitous sessions with leading aviation professionals and networking events with opportunities to grow business and make deals. Register early to secure housing! Tis the season for renewals, fa la la la la la. 2016 ISTAT memberships expire on 31 December 2016. To avoid a lapse in benefits, including 2017 member conference rates, click here to log into your profile and renew today. Congratulations to the second class of ISTAT University (ISTAT U) graduates! The celebration took place earlier this month at Embry-Riddle Aeronautical University (ERAU), Daytona Beach. The ISTAT Foundation, in collaboration with ERAU, Daytona Beach, has delivered a specially designed one-year aviation finance and leasing program. In addition to the on campus program, ISTAT U is available to qualified students from around the world by way of a distance learning, web-based course offering. Learn more about the ISTAT U here: www.istat.org/istatu. The ISTAT Internship Portal is now open, and we would like to invite all ISTAT member companies to post their summer or graduate internship positions once they're open to ensure interest from the best candidates. This article is the first of a series to be published in Jetrader to tell the ISTAT story from the appraisers' perspective so that members can better appreciate the organization's origins, ethics and values, and how the ISTAT Appraisers' Program remains one of ISTAT's cornerstones. Aviation International News A definitive agreement between Boeing and Iran Air announced 11 December calls for delivery of 50 737 Max 8s, 15 777-300ERs and 15 777-9s valued at $16.6 billion at list prices. But questions surrounding political environment and its potential effect on the deal remain as an incoming U.S. presidential administration openly critical of Barack Obama’s signature nuclear settlement with Iran prepares to take office in January. The Wall Street Journal 7 to 7.75 percent is the Indian government’s projected gross domestic product growth for the fiscal year ending March 31. India is the world’s fastest-expanding major economy, and travelers are increasingly flying into, out of and around the South Asian country for business and pleasure. The China Post Far Eastern Air Transport has announced plans to take over financially striken carrier TransAsia Airways. "We are now speaking with some banks and are 80 percent certain we will be able to take over TransAsia," FAT's Chairman Fenno Chang said in an exclusive interview with The China Post 12 December.